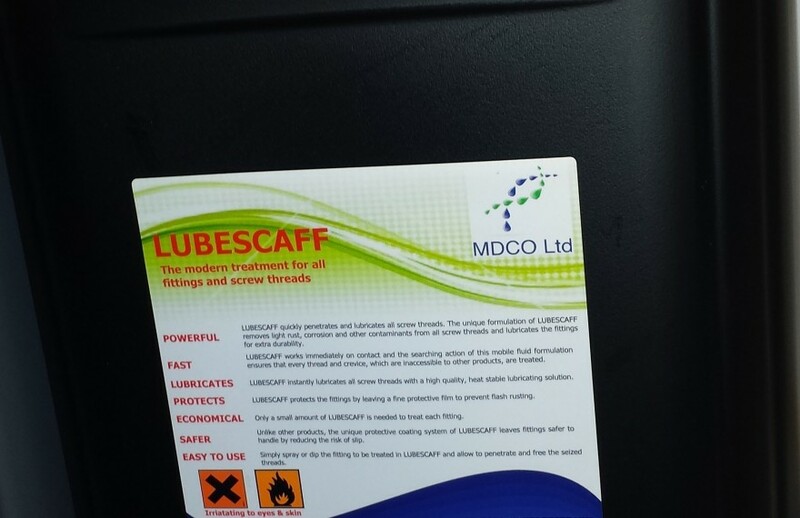 LUBESCAFF quickly penetrates and lubricates all screw threads. The unique formulation of LUBESCAFF removes light rust, corrosion and other contaminants from all screw threads and lubricates the fittings for extra durability. Works immediately on contact and the searching action of this mobile fluid formulation ensures that every thread and crevice, which are inaccessible to other products, are treated. Instantly lubricates all screw threads with a high quality, heat stable lubricating solution. Protects the fittings by leaving a fine protective film to prevent flash rusting. Only a small amount of LUBESCAFF is needed to treat each fitting. Unlike other products, the unique protective coating system of LUBESCAFF leaves fittings safer to handle by reducing the risk of slip. Simply spray or dip the fitting to be treated in LUBESCAFF and allow to penetrate and free the seized threads.